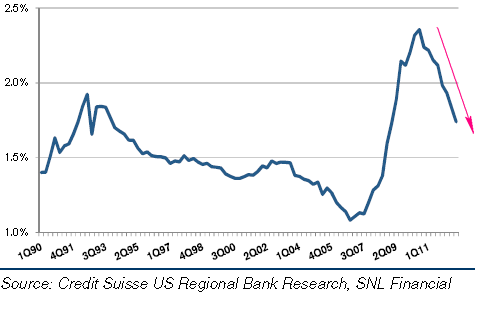 US regional banks have over-reserved for loan losses during 2009-2010 period, expecting a wave of defaults. Default rates however have been lower than projected and banks have been releasing these reserves into earnings in the past couple of years. According to Credit Suisse, that trend is expected to continue. CS: - US Regional Bank reserve levels have declined by 38% from the peak levels of 1Q10. However, we think reserve levels may still decline by 11% to the trough, which we estimate will form in 3Q14. As banks release reserves for existing loans (not to be confused with reserves at the Fed), the amount of loans they have on the books continues to grow. At some point (in 3Q14 according to CS), the absolute levels of reserves will begin to grow again. For now however the release in reserves is offsetting generally weaker than expected core revenues. CS: - We remain cautious on the industry as we forecast core revenues to miss expectations over the next 12 months. While our net interest income forecasts trend below consensus expectations, our long-term EPS forecasts are only modestly below expectations as we have larger reserve releases than consensus in our models. Reserve reductions are low quality drivers of earnings; however, they still support higher capital payout ratios through the annual CCAR (capital stress test) process, and also imply a faster capital growth rate. Declining interest income and fees are the reasons for this caution on core revenues. CS is also concerned about a recession next year, driven mostly by the US fiscal cliff (see discussion). So far however (particularly while releasing these loss reserves) regional banks have materially outperformed the overall banking sector and have continued to perform in line with the broader market.